Jeel al Amal is considered to be an Institution aimed at the Public Interest by the Dutch fiscal authorities. Gifts are tax deductible. 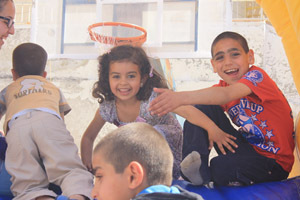 Gifts will be used to help finance the camp for boys who have no home to go to during the summer holidays and for the maintenance of this website. Transfer of money in Euro’s to Jeel al Amal from a private account in another EU-country is possible free of charge through telebanking. The photographs were taken by Jbara. Please make others, for whom this website may be of interest, aware of its existence. 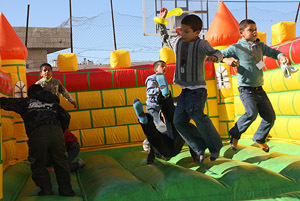 On the 8th of April 2012 a girls school in Jerusalem entertained the children of Jeel al Amal by bringing inflatable games to the school, slides and bouncers. Along came two clowns with all their tricks and of course not to forget their inflated balloons. 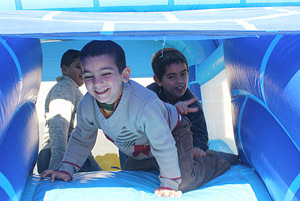 As soon as the inflatable devices were being set up in the school playground, the children got very excited and could hardly sit still for this to take place. Everybody joined in, big and small. 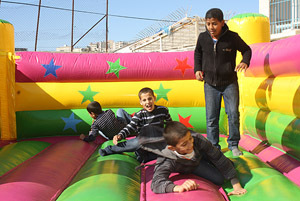 It was so wonderful to see the children jumping around freely and laughing from the depth of their hearts. 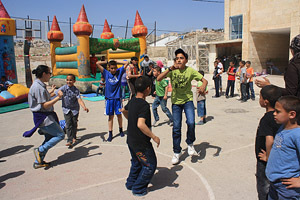 Music was played aloud and the children were dancing on the rhythm of the songs side by side with the organizers. 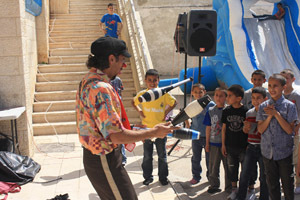 The children were gathering around the clown giggling and laughing at his funny gestures. 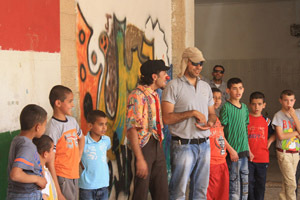 Snacks and sweets were distributed at the end of the day. That evening the children went to bed exhausted yet filled with memorable thoughts of a wonderful day and yet many more to come!